Whether you need to clean or pre-treat small surfaces or large areas, or need to work with one or two lances at the same time, the WIWA HIGH PRESSURE CLEANER covers a wide range of applications. Its optimal field of use is not just limited to corrosion protection, but it also includes the oil and gas industry, food industry, shipping, building and roof sanitation as well as the cleaning of buildings. With the combination of high pressure and finest atomization as well as appropriate additives not only rust, but also greases, oils and resins can be removed most effectively. 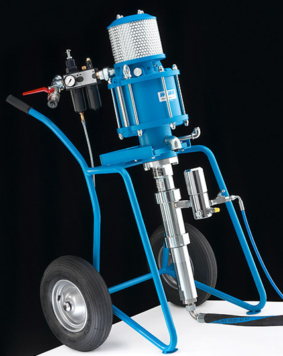 Difficult to access areas, such as profiles, angular structures as well as pipes of most different diameters can now be easily cleaned with the WIWA HIGH PRESSURE CLEANER equipped with the unique swivel nozzle. The benefits are quite obvious: The frequently increased material costs associated with corrosion protection, which are caused by the spraying material being polluted by rust particles falling down while preparing the area by means of shot blasting, can be considerably reduced by using the WIWA HIGH PRESSURE CLEANER, because the preceding cleaning enables the multiple use of the blasting material. The handy and mobile WIWA HIGH PRESSURE CLEANER also convinces on the high seas. With its low weight and easy handling the WIWA HIGH PRESSURE CLEANER eases cleaning and repair work on and under deck. Since the WIWA HIGH PRESSURE CLEANER in all its equipment stages obviously is fully explosion protected, it can also be used in the offshore industry.